Photo by Evan Vucci, Associated Press // President Donald Trump listens to a meeting on immigration. On January 11th in a closed door meeting with a bipartisan group of senators, Trump identified many underdeveloped countries from Africa, the Caribbean and Central America as sh*thole countries. These countries have had many individuals come to the US as relief for major disasters that occured in their home countries. 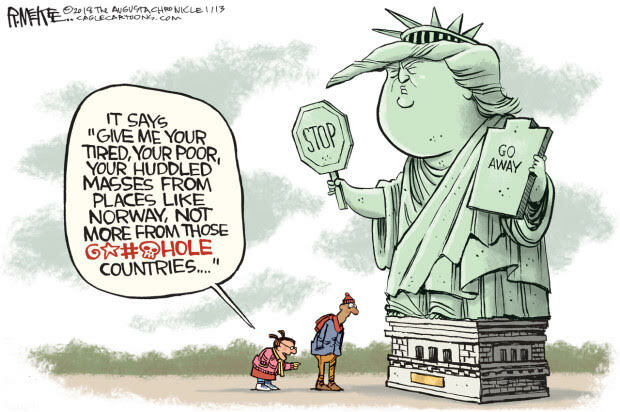 “Why do we want all these people from shithole countries coming here?” said Trump. Some top officials from these countries took the news hard. Haitian Ambassador to the U.S., Paul G. Altidor, said that Trump’s comments were “regrettable… based on clichés and stereotypes rather than actual fact.” The government of Botswana, a developing nation in Africa, commented that Trump’s words were “reprehensible and racist,” according to NBC News. These comments bring to mind the infamous travel ban President Trump put on many Middle Eastern countries to try and stop citizens entering the U.S because many were suspected of being terrorists. Similarly, Trump painted a negative picture of Haitians in his comments, ”Why do we need more Haitians?,” “Take them out,” and “They all have AIDS!” according to NBC News sources. Many Haitians in this country are on Temporary Protected Status visas after they were forced to evacuate because of Haiti’s earthquake in 2010. The U.S. government granted 59,000 Haitians temporary visas and it was announced that the Trump Administration is ending TPS for Haitians in July 2019. If unable to receive a new visa, they will be deported. Trump followed by saying that he would prefer people from Norway immigrating to the United States, which is a predominantly white country. Trump also took to twitter to deny all of these statements saying “Never said anything derogatory about Haitians other than Haiti is, obviously, a very poor and troubled country. Never said ‘take them out.’ Made up by Dems. I have a wonderful relationship with Haitians.” His tweet garnered thousands of responses, retweets, and favorites. Because Trump is the president, his words and actions represent those of America as a whole in the eyes of other nations. His comments came off as ignorant to many due to his disregard for the rich histories these countries hold and the resilience of the proud, vibrant people who live there. As the president of one of the most powerful and influential countries in the world, one would expect that Donald Trump would set an example for smaller countries who idolize America. Be the first to comment on "OPINION: Trump’s comments drawing criticism from students"